High End Systems MMS (EN) | PRO MUSIC, s.r.o. Using a custom front surface, optically flat mirror, leveraging High End’s optical expertise, the MMS range delivers sharp, bright and incredibly detailed High Definition images anywhere the designer wants, when combined with any of Barco’s high brightness large venue projectors, including the HDQ which outputs a staggering 40,000 lumens! The custom mirror is designed to allow an incredible 96% transmission of light! No longer are bulky, unwieldy and very heavy yokes required to achieve the freedom to position the image in multiple locations. No longer will expensive, one off custom rigging frames be required. The MMS system allows for the projector to be rigged in its natural position, with the mirror then doing all the work, remotely! The MMS range is controlled over DMX or Art-Net and in the near future will link up with Barco’s projector toolset allowing for quick and simple setup in many applications. The projectionist will be able to position and store presets directly within the Barco suite of software. There are two versions the MMS-100 including an Axon HD media server on-board and the MMS-200 being only the mirror. Move and position the brightest projectors in the world without the hassle, expense, weight and inaccuracy of existing systems. Deliver sharp, bright and detailed images without distortion or loss of output. 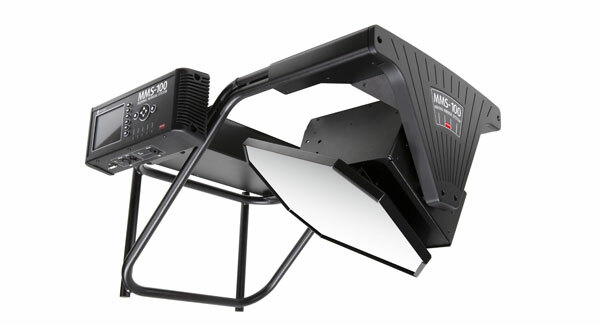 Enjoy quick and easy setup, specially when the projectors rigging position might be awkward. Do away with one off, expensive rigging frames. Turn any floor (or ceiling) into a projected advertising space. Incorporate and change video on-the-fly as excitement happens. Project onto virtually any spot in the venue with video or graphics content. Create large panoramas on any surface at one time followed by moving the images around the venue to create excitement, all from the same projector.